So I did it. I finally gave in. 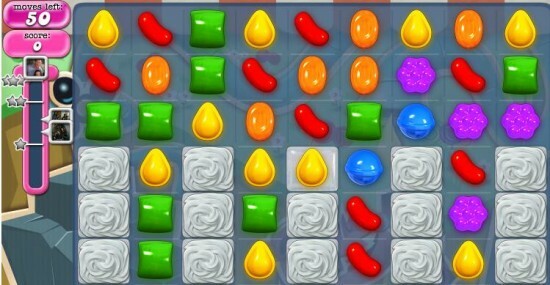 After months of avoiding Facebook invites from friends, family and total strangers, it was only after the recommendation of our own Matt Raub when he talked about how addictive it was that I decided to give Candy Crush Saga a chance. And now I see what the hype is about. On the surface, one could attempt to say that Candy Crush Saga is a ripoff of the classic “Match 3” formula that made titles like Bejeweled so successful. But it takes bits and pieces from various other “Match 3” games into an incredibly simple but addictive formula. Early levels involve hitting a certain amount of points within a specific number of moves. Quickly the gears get clogged up when levels change shape and it isn’t just the perfect square that they are used to. And then comes the jelly which players must not only hit a minimum score on but also make matches over specific squares to clear them. And once you think you’ve mastered that, then you have “ingredients” which are pieces that you must work down to the bottom of the screen by eliminating the blocks below them. The ink has barely dried on the contract for Facebook’s aquisition of Instagram and the company has already dropped a brand new camera app for iOS devices. The new app, called Camera for iOS, and is intended to make uploading and viewing Facebook photos faster and easier. Perhaps not coincidentally, the app features Instagram-like filters to modify users’ photographs before uploading and also offers the ability to upload multiple photos, unlike Facebook’s current app for iOS. The timing of this release is more than likely just a coincidence as the company had to have had this app in development long before their purchase of Instagram. It’s more likely they were trying to mimic some of Instagram’s features in their own app but then decided it would probably just be easier to buy Instagram and incorporate it info Facebook. Plus, they get one more important thing with that purchase: the users. This new app is just the beginning. Look for an improved app sooner rather than later. Facebook’s Camera for iOS is available now on the Apple’s App Store. And no, there’s no Android version . . . yet. If you’re an Android user who also enjoys using the Google+ social media service, you may have been a bit miffed to see the iOS version of the G+ app get a big update a few weeks ago. Well don’t worry, your time has come. That’s right, Google today took the wraps off a big update for the Android version of the Google+ app and with it has come several improvements to the UI including the big thing you may love or hate: giant pictures. The new app also makes starting a hangout with your pals possible from a mobiel device. In addition, there’s also a new navigation ribbon on the left side, much like the desktop version, that features quick shortcuts to all the areas of Google+ you might need to go to. You also get some new transitions as you scroll through feeds, the ability to download pics as wallpaper, the ability to edit posts inline and more. The new app is available through the Google Play store. So, what do we think? The war for dominance in the social media space will never really be won. Even with Facebook and Twitter dominating the scene at the moment, there’s always going to be other players looking to draw eyeballs and attention to their networks and platforms. One such player in this war is search giant Google, whose Google+ social network debuted towards the end of last year. Sadly, even with some impressive user numbers, over 100 Million at last count, a new study suggests that “social activity and user engagement” on the service is far from good. In fact, it’s downright terrible. Over at Fast Company, the findings of an RJ Metrics study that analyzed data from a sample of 40,000 public Google+ accounts in an effort to determine just how successful the social network is was revealed. The reports main conclusion? Google+ is a ghost town. According to the report, the average post on Google+ gets fewer than one “+1,” the equivalent of a “like” on Facebook, and fewer than one reply. Links and other items shared publicly by Google+ users are re-shared just 0.17 times per post, on average. In addition, users averaged about one post every 12 days, usage per user declines each month after they make their first public post and about 30% of users who make a first public post never make another one. As a daily user of Google+ (here’s my profile) I find this report interesting. On the surface it paints a pretty grim picture of Google+ and its user base. However, it only takes into account public post on the service, something I almost never make. Yes, you read that right. Facebook is apparently closing a deal to buy super cool photo sharing service Instagram for a Billion dollars. Given the proliferation of smartphones with decent to very good cameras, it made sense that what followed was a whole lot of camera and photography apps for those smartphones. Among the most popular for iOS devices, with over 27 million registered users, is Instagram. But what of Android and its users? Are they supposed to sit on the sidelines and not be able to enjoy all that Instagram goodness?Not much longer, apparently. As we previously reported, the app was announced for Android in December but not specific release dat was given.